The younger (and infinitely more talented) sister of Mary-Kate and Ashley Olsen stars in directors Chris Kentis and Laura Lau’s English adaptation of Gustavo Hernandez’ Uruguayan film of the same name, whose screenplay is reportedly based on a true story from the 1940s. 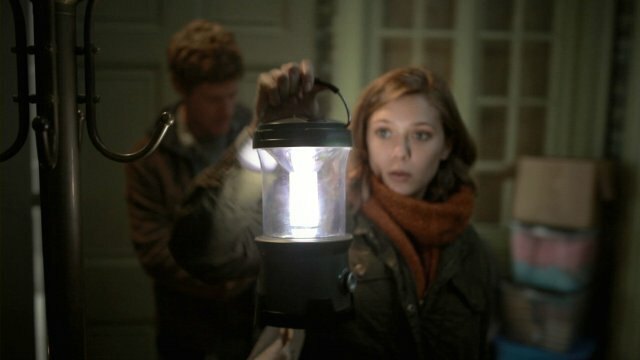 Elizabeth Olsen stars in the psychological thriller as Sarah, a pretty but solitary girl in her early twenty-something years who is given the task of helping her father (Adam Trese, Zodiac) and uncle (Eric Sheffer Stevens, Julie & Julia) clean and renovate the lake house from her childhood so that it can be sold. Once Uncle Peter storms off after an argument with his brother, Sarah and her dad are left alone to finish cleaning up the leftover junk in the house that had been acquired over the years. Sarah hears strange noises soon after, and a thorough investigation of the nearby rooms leads to the discovery that her father has been knocked unconscious and that there appears to be an intruder in the home. The home invasion movie genre is quite familiar, but the direction that Silent House takes follow more of a non-linear format involving a nightmare-esque pattern complete with looming figures around corners and visions of bloodied bathtubs and broken glass bottles. Sarah starts to have hallucinations of ghostly little girls and spends the next forty minutes or so running from room to room in the house trying to evade the intruder. Sarah’s mental state seems to deteriorate as the film goes on until eventually she reaches her breaking point and is forced to remember what she’s been blocking out for the last decade and deal with the revelation accordingly. Those familiar with films such as An American Haunting may be able to predict the path that the film eventually heads toward, but may still find the climax of the film to be disturbing despite its predictability. What makes this adaptation unique is not the story or the characters involved, but rather, the manner in which the movie was filmed. Cinematographer Ivan Martinovic follows in the footsteps of Alfred Hitchcock’s Rope by filming the entire 88 minute film in a single shot, without breaks or cuts. This method isn’t used very often, as any misreading of the actor’s lines or set malfunction would result in starting the entire filming process from the beginning, even if you were already halfway in. Martinovic manages very well, however, and the shakey handheld quality brings a more sinister and disturbing quality to the film that add to its overall mystery and feeling of unease. Olsen displays her expertise at playing a mentally unstable and disturbed girl, conveying every emotion with a conviction that neither of her older sisters have ever been able to replicate. She spends most of the film hiding from the intruders with a look of terror on her face, as well as portraying convincing crying fits and the appropriate scream here and there. Co-directors Kentis and Lau are no strangers to the psychological thriller genre, having previously worked together on the scary water chiller Open Water. Their second film is equally as unsettling in a completely different way, showing that the duo has potential in films on land as well as in the middle of the Atlantic.